I’m a superstar at any game requiring the knowledge of vast amounts of trivia. 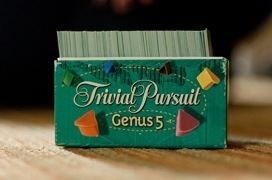 Trivial pursuit, Jeopardy, etc are my forte. I have so much junk in my head, it’s kind of a scary place to be. I’ve passed this love of facts, figures, history, geography, pop culture, etc on to my second son as well. He’s captain of his school’s academic team and usually wins trivia night at Mellow Mushroom. Arcana is our drug of choice.